The Colombo Plan Staff College (CPSC) held an in-country program in Malaysia focusing on the creation of culture of quality and excellence in TVET through regional accreditation at the Politeknik Sultan Abdul Halim Mu'adzam Shah (POLIMAS) Campus in Jitra, State of Kedah from April 17 to 21, 2017. The program was attended by 31 TVET administrators, teachers and APACC focal persons of polytechnic institutions in Malaysia. 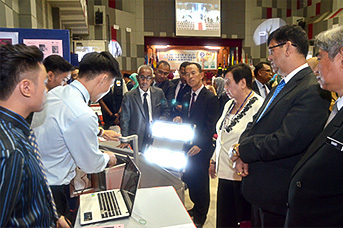 The program aimed to assist the Government of Malaysia with its initiatives on quality assurance by providing knowledge on the organized structure for maintaining accreditation as a quality assurance mechanism based on quality systems standard on TVET Institutions that promotes the exchange and recognition of standards and criteria across Asia and the Pacific Region. It also aimed to provide a more detailed simulation of the accreditation activities of the Asia-Pacific Accreditation and Certification Commission (APACC). The program lessons and modules were designed for the participants to be able to explain the meaning of organizational excellence and rationalize the need and importance of standards, quality and accreditation relative to the national, regional and global labor market. It was also designed to justify the need and importance of regional accreditation and describe APACC accreditation as a continuous improvement approach to organizational excellence in TVET. In addition, the participants were expected to develop an action plan for creating positive and enhanced effectiveness of TVET and prepare for a possible APACC accreditation exercise. Supervision of the program was under the helm of Dr. Ramhari Lamichhane, CPSC Director General. In-charge of the program coordination was Dr. Romulita Alto, CPSC’s Faculty Consultant while the local logistics was managed by Ms. Suzianah binti Sahar, Senior Assistant Director of the Professional Excellence Division, Department of Polytechnic Education (DPE), Ministry of Higher Education Malaysia. Dr. Mohammad Naim Yaakub, former Director General of CPSC, took part in the program as a local resource person and contributed his experience in APACC. Topics tackled during the program were: (1) Concept and Philosophy in Building TVET Excellence through Accreditation, (2) Role of APACC in Total Quality management and (3) Challenges and Opportunities of Regional Accreditation of TVET Institutions through APACC, which included a seminar on the existing APACC Self-Study report. In conjunction with the program, a Seminar on “Accreditation for Productive Change” was held on April 20, 2017 at the same venue. The seminar was organized in recognition that the pursuit of change for excellence is an institution-wide commitment involving many dedicated participants from different departments adhered by a common vision of continuous improvement and institutional effectiveness. The seminar was attended by 145 professionals from different offices of DPE and the rest of Malaysia as well. The seminar offered awareness on accreditation’s several benefits to TVET beyond just securing a glowing affirmation from an accrediting body. The most valuable benefit being a unique opportunity was to listen to experiences on how some TVET institutions created a durable internal process for continuous improvement that survives the verification process and hear what the industry has to say about accreditation as a process for quality assurance. Speakers during the program included: (1) Mr. Shaharizal bin Ariffadillah Operations Director Aerospace Composites Malaysia (ACM) Sdn. Bhd. ; (2) Assoc. Prof. Dr. Ahmad Yasir bin Md. Said, Engineering Accreditation Department, Board of Engineers Malaysia (BEM) and (3) Ms. Yusma binti Yusof, Deputy Director (Academics) of the Politeknik Port Dickson. TVET institutions have shown improvement along major criteria and this affirms the positive impact of accreditation for quality improvement in TVET institutions’ services. These results have encouraged our stance and belief in the use of accreditation as an effective mechanism for quality improvement in TVET. In the Philippines, recognition of APACC is further strengthened by requiring TVET schools to be accredited by APACC if they want to offer Senior High School. Please refer to the Memorandum issued by the Department of Education – Philippines, for further details.